There are days in late winter when the Pacific coast enjoys a brief spell of clear, warm weather. Most of the winter storms have passed and the summer fog has not yet settled in. This is when some coastal communities plan their annual beach clean-ups. In this sequel to Ellie's Log and Ricky's Atlas, Ellie and Ricky travel to the Oregon coast from their home in the Cascade Mountains to help with a one-day beach clean-up. Hoping to find a prized Japanese glass float, they instead find more important natural treasures, and evidence of an ocean that needs its own global-scale clean-up. Ellie and Ricky are amazed by their discoveries at the edge of the world's largest ocean. Together, they realize the power of volunteering and grapple with the challenges of ocean conservation. In her journal Ellie records her observations of their adventures in her own words and pictures. 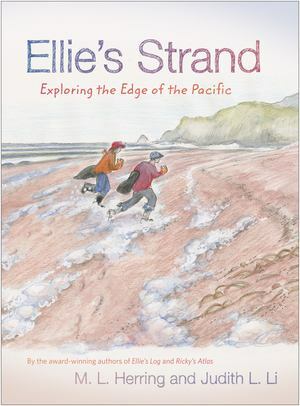 With charming pen-and-ink drawings and a compelling story, Ellie's Strand makes coastal science exciting for upper elementary school students. It will be a treasured companion for young beach explorers everywhere.